We’re delighted to announce that our next Proud to Perform music tour will take place in 2020. Once again we will be fully funding a music tour to Europe for a young ensemble, who would otherwise not be able to afford to tour. Proud to Perform was the brainchild of our Senior Account Manager Hannah Bastick who wanted to challenge the idea that touring is just for rich people and give a wonderful performing opportunity to a disadvantaged group. Everyone at Club Europe felt it a great privilege to be involved in such a lovely project and is thrilled to be launching a second tour. Although applications will not open until September 2018, we would welcome interest now from any leaders of disadvantaged youth ensembles who may want to know more. Please get in touch with Hannah at Hannah.b@club-europe.co.uk. Our second Proud to Perform tour will come exactly five years after last year’s inaugural trip which saw our Proud to Perform winners Southwark Children’s Brass Band (SCBB) enjoy their first ever concert tour to Paris. 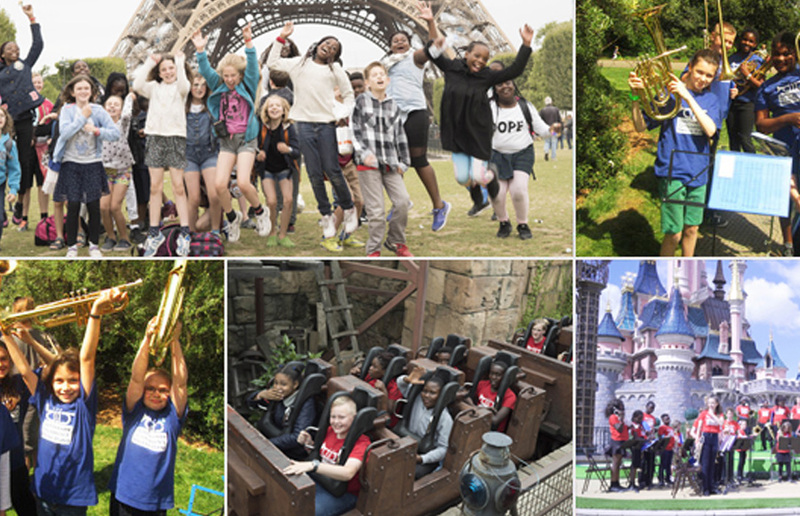 SCBB’s fully-funded three-day music tour to France included a performance at Disneyland Paris. Originally the charity, the Southwark Children's Foundation, which aimed to give underprivileged children experience of art, music and culture, SCBB has grown to around 50-60 players from a range of social backgrounds, all aged between 7 and 14. The Paris tour was a wonderful opportunity for the band, many of whom had never been abroad before. “A highlight of the tour was the performance at Disneyland and then all the fun afterwards once we were back in the park. The students were more than up for the challenge of a serious performance and coped with the microphones, the stage layout and the sound check really well. They were completely on show the whole time which I don't think they expected. The venue just blew them away. “My highlight was getting to know the children really well and watching them make new friends. Another highlight was a girl who had re-joined the band (after 2 years away) to come to Paris and was a natural leader in the group. The band learned as a group to perform more tightly together and they played really well. The whole process with the concert at the end really pulled the band together and they sounded fantastic. Our thanks go to P&O Ferries & and family-owned Andrew’s of Tideswell Coaches, Derbyshire. Both companies generously offered us subsidised rates for this special tour.